The Bloggers before Scalp Facial. The temperature is going through the roof with 33 degrees in Mumbai. Ever wondered how much gunk our hair follicles must accumulate with excess sebum, humidity and sweat? We have Facial scrubs for the grime on facial skin. What about our scalps? I always wondered why we don't get Scalp Scrubs since I suffer from scalp flakes in winter. So as home remedies, I would use various concoctions and rinses that would help remove the build up. Currently, Scalp Facials or Scalp Micro-dermabrasion Treatments are frantic just like the sun. So I picked up the opportunity to get myself a Scalp Facial and Try the Nioxin Hair System Kit. 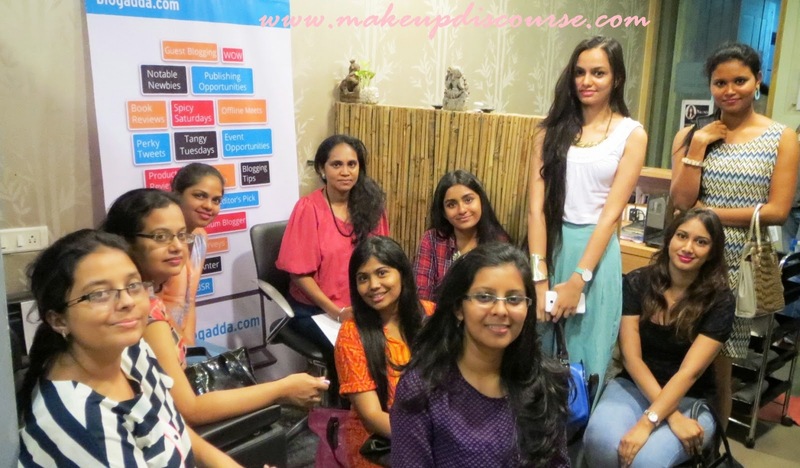 The venue was Nalini and Yasmin Salon in Bandra. 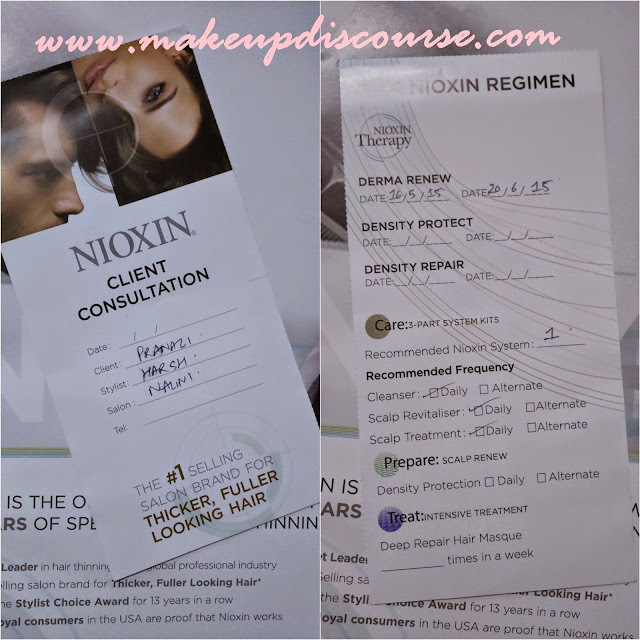 We were quickly introduced to the brand, Nioxin with an in depth explanation of How Nioxin works and Why it is necessary to undergo Scalp Facial before using the Nioxin Hair System Kit. Natasha Naegamvala and Harsh attended all our doubts and queries patiently. 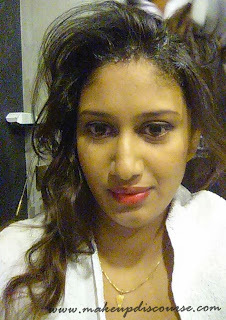 I'm revealing more details on Scalp Facial and my experience below. What are Scalp Facials and what does they exactly do? Hair grows and falls within a certain cycle that varies from person to the lifestyle they follow. Hairfall is normal when you loose 50-100 strands of hair a day. When a stand of hair completes it cycle, the Dermal papilla or the spot from where the hair bulb grows out turns vacant. This spot then accumulates sebum, dust, pollution, sweat and other foreign bodies restricting new hair growth or poor hair growth. Scalp Facial or Scalp Microdermabrasion helps vacant or unclog (is a better word) these spots which helps a better growth cycle as well as gets rid of scalp flakes. It is equivalent to deep cleansing pores on facial skin. So why can't we steam our scalp or massage scalp for a better Blood circulation? Scalp massages are great, said Natasha. But they stimulate the hair follicles but they don't unclog the Dermal Papilla. From what I have read and experienced, Steam open up the pores on the scalps for better absorption of the product say Oil or Scalp conditioner better. The AHA~ Alpha Hydroxy Acids (Glycolic Acid) is a natural exfoliant derived from Fruits, Vegetables and Botanicals. These AHA gently exfoliates the scalp unclogging the follicles and Dermal papillae. ~ The System regime contains Nioxin Cleanser, Nioxin Scalp Revitaliser (Scalp & Hair Conditioner) and Nioxin Scalp Treatment (Scalp Leave-In) is ought to be used Daily or on alternate days at most. Nioxin Hair System Kit costs roughly around 2300 INR. ~ Treating Hair to Oil or Oil massages should be avoided. ~ Avoid using any other products. Blow drying is allowed. ~ Treating your scalp to Nioxin Scalp Renew Dermabrasion Treatment is quintessential if you choose switch to the System. Nioxin Scalp Renew Dermabrasion Treatment costs around 3000 INR for each session which should be followed up after 30-45 days. ~ Nioxin Scalp Renew Dermabrasion Treatment is Salon only Treatment. So book yourself an appointment with Natasha or any other salon that provides Nioxin. ~ Nioxin Scalp Renew Dermabrasion Treatment can be done even when you don't face thinning issues. After the discussion, We all underwent consultation and Scalp diagnosis. We were asked about our concerns, lifestyle and health issues. After the session we were recommended System number accordingly. My concerns: Crown Hair Thinning and Lack of volume. Since my hair aren't chemically treated and are naturally thin, I was recommended Nioxin Hair System Kit #1: Normal to Thin-Looking Hair. We were quickly treated to Scalp Facial or Scalp Microdermabrasion Treatment one by one. I was attended by Harsh. The treatment is applied by parting your hair in sections and only on scalp. It is then left on for about 10 minutes and followed with the System Kit. Nioxin Scalp Renew Dermabrasion Treatment peppermint oil, white tea extracts and other botanicals which felt soothing and pleasant in this scorching heat. The system of Cleansing, Revitalising and Scalp Treatment and blow dry was carried out by Nikita on me. My Hair felt a little weighed down and my scalp felt squeaky clean. I certainly felt my hair roots/Scalp if touched, smooth and refreshed. And they did feel thicker to touch, like every strand had it's own individual definition. I have already started using the Nioxin Hair System Kit #1 every single day! Check back after 20 days for my conclusive brainwork about the Nioxin Hair System Kit#1. 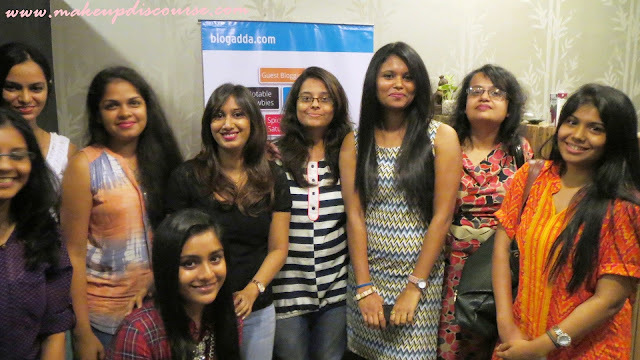 And here are more pictures from the Blogadda Event.